We offer worldwide map coverage which can be customized to the look of your brand. 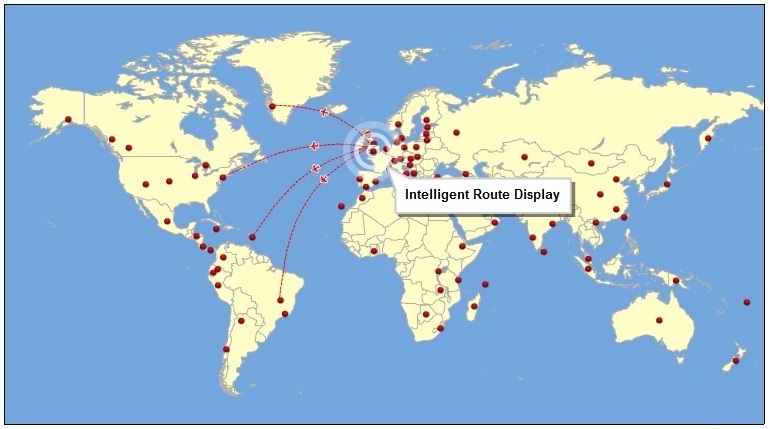 Routes, images and text can automatically be displayed through the data fed system to create a powerful tool for displaying, searching and promoting your air routes.Whether you are selling flights alone or also offering holiday and accommodation packages an effective visual search display is a powerful asset in maximising sales. The new Igemoe Air Route System provides a cost effective solution that can be delivered fully on brand, gives viewers a focused and rewarding experience and, on the technical side, is easily integrated into existing systems. Maps are created automatically through the data driven system, removing the man hours involved in hand updating route maps and schedules. The Route System makes displaying key information easy. The Route System can be used as a powerful visual search tool, allowing customers to quickly find the option that best suits them. The System has been designed to work across mobile devices and desktop computers. Maps can be fully customized to your brand.